How Will Bankruptcy Affect My Credit Report? A common question many people have about the bankruptcy process is the effect it will have on their credit report. The Bankruptcy Court itself has nothing to do with credit reports, which are maintained by private agencies. But federal law still governs how long these agencies can maintain a public record of your bankruptcy, and in some cases may provide remedies for creditors and debt collectors who misuse your credit report post-bankruptcy. In a Chapter 7 bankruptcy case, the court discharges your debts after liquidating any non-exempt assets you may have. The discharge means you no longer have any obligation to pay the debts. This does not mean, however, that the debts will be removed from your credit report right away. Under the Fair Credit Reporting Act, a discharged debt can remain on your credit report for up to seven years. The bankruptcy itself can be reported for up to 10 years. So if you file for Chapter 7 bankruptcy and receive a discharge in 2018, your discharged debts may remain on your credit report until 2025, and the bankruptcy discharge until 2028. With a Chapter 13 bankruptcy things work a little differently. In Chapter 13 the Bankruptcy Court does not immediately discharge your debts. Instead, you must submit a plan to repay your debts over a period of 3 to 5 years. Outstanding debts are not discharged until the repayment plan is completed. 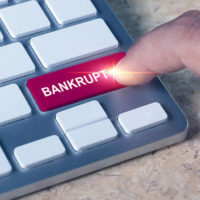 A Chapter 13 bankruptcy remains on your record for 7 years rather than 10, but keep in mind individual debts may actually stay on your credit report longer since they are not immediately discharged as in a Chapter 7 bankruptcy. It is a good idea to periodically check your credit report before and after a bankruptcy case. By law the three major credit reporting agencies must provide one free copy of your report each year. In some cases you may notice outstanding debts no longer appear on your credit report even before your bankruptcy is complete. This is because unpaid debts automatically fall off your credit report after seven years unless the creditor has obtained a civil judgment against you. So if you have not paid a credit card balance in 10 years, that debt will no longer appear on your credit report. Your credit report also contains a list of anyone who has “pulled” your information recently. This can be important, since some creditors (or third-party debt collectors) may improperly pull your credit report after your debt to them has been discharged in bankruptcy. It is against the law for any debt collector to harass you once you file for bankruptcy. Are You Considering Chapter 7 or Chapter 13 Bankruptcy? Bankruptcy will negatively affect your credit in the short term. Then again, if you are facing thousands of dollars in unpaid debts, that may be the least of your problems. A qualified Miami bankruptcy attorney can review your financial situation and discuss your options with you. Contact the Law Office of Julia Kefalinos at (305) 676-9545 to schedule a consultation today.